This should be grown in every home garden for ornamental and border effect. Chervil is invaluable for aromatic and flavoring purposes. 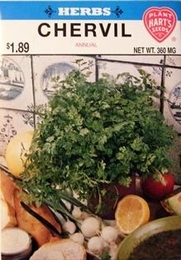 Used like parsley, fresh and dried. To dry for winter use, cut often to prevent flowering. Gather leaves on a dry summer day. Place leaf sprays on stretched cheesecloth or netting in a cool shed or room. When dry, remove leaves from stems and seal in wide mouthed bottles.